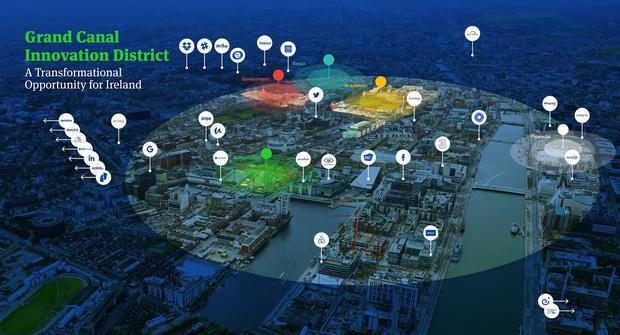 Plans for a new innovation district in the heart of Dublin, bringing together multinationals, new talent and university expertise, have been unveiled. Trinity College Dublin has launched its vision for a Grand Canal Innovation District (GCID), modelled on similar ideas in major cities such as Boston, Toronto, Rotterdam and Barcelona. The plan is to create an ecosystem that will allow for the cross-fertilisation and nurturing of new ideas between companies, researchers and entrepreneurs. At its core, will be a new €1bn university campus, dedicated to technology and innovation, to be created by Trinity on a 5.5 acre site at Grand Canal Quay, adjacent to Macken Street. Trinity Provost Dr Patrick Prendergast, said the presence of a world class university at the heart of the GCID would be “the catalyst for collaboration and partnership between industry and universities”. Many global tech giants, such as Google and Facebook, have their European headquarters in close proximity to the targeted district and the area is also home to a host of start-ups. Stephen McIntyre, the former MD of Twitter said the multinational and start-up sectors in Dublin were like two unconnected cities and he welcomed the university/innovation district link-up “as the way to bridge the two”. While Trinity will be the anchor university, there will also be collaboration with other universities in the capital. . A memorandum of understanding has also been agreed between Dublin’s universities and the Government advisory group. The aim is for the GCID to become an international magnet for talent, investment and jobs. Trinity Chief Innovation and Enterprise Officer Dr Diarmuid O’Brien said the GCID would provide the scale, critical mass and density to resonate with the best global companies and to fully realise the ambitions of Ireland’s indigenous start-up and scaling companies. He said it spoke eloquently of the vision to make Ireland the tech capital of Europe and plans to ensure that the jobs of the future are created first in Ireland.